Tires are your car’s critical connection to the road and can affect your ride, handling, traction and safety. 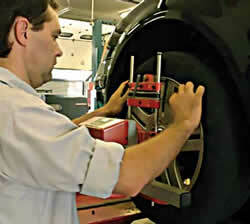 Maintaining tire balance and wheel alignment reduces tire wear and improves handling and fuel economy. Tire replacement is necessary if the tread depth is below the minimum legal requirement, or the sidewalls are severely cracked or punctured. In some cases, tread punctures cannot be repaired. Normal wear and road conditions can take their toll on your car’s steering and suspension system, and can disrupt the alignment settings. Ball joints, tie rods, steering arms, bushings and other suspension parts all wear gradually over time. Springs will gradually sag and age as miles accumulate. All of these will affect alignment angles and adjustments need to be made or components replaced to restore optimum handling. Have your car’s alignment (all four wheels) checked at least annually and also at the first sign of improper handling or uneven wear. Your technician will make adjustments to the camber, caster, toe and thrust angle as needed. Request a wheel alignment when you purchase a set of new tires. Have the tires rotated every 6,000 miles. Consult your owner’s manual, tire dealer or manufacturer for the correct rotation pattern for your tires. Rotation time also serves as a good opportunity to have the wheels balanced. Unbalanced wheels can cause rapid wear of shock absorbers and struts, and wheel balance can change as a result of normal tire wear. Rotating the tires to keep their sizes equal is critical on full-time four-wheel drive vehicles, and replacing all four tires at the same time, is highly recommended. The Tire Pressure Monitoring System (TPMS) may need to be replaced when servicing or installing new tires. Why does my car shake at certain speeds? Do tires have to be replaced in pairs? In 1996, an orange light on your car’s dashboard labeled “Check Engine” or “Service Engine Soon” became standard on all car makes and models. The light tells you there’s a problem with your car’s engine and powertrain control system. An illuminated “Check Engine” or “Service Engine Soon” light indicates that a vehicle system, such as the ignition, fuel injection or emission control, is not operating properly, even if the vehicle appears to be running normally. Only the right diagnostic equipment can determine the problem detected by your car’s on-board diagnostic system (OBD). Ignoring a check engine light can negatively impact your fuel economy or cause damage resulting in more costly repairs. A steady light should be diagnosed at the first convenient opportunity. A flashing light indicates a problem that is currently happening and may require immediate attention, such as catalytic converter damage. 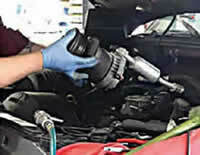 A technician connects a diagnostic scan tool to your car’s computer system to determine the problem. Further testing and diagnosis may be required to pinpoint the exact cause of the problem. 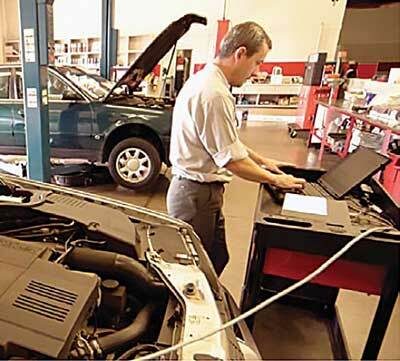 Are you trained and certified in OBD II diagnosis and repair? Proper heating and cooling performance is critical for interior comfort and for safety reasons such as defrosting. The HVAC system will work as designed if properly serviced. Keeping a vehicle looking new is tough, even with today’s long-lasting finishes. Dents, dings, cracked glass and dirty upholstery are several items that age the appearance of a vehicle. Fortunately, technology and advances in vehicle protectants have helped rectify these problems, making the fixes quicker and less expensive. Caring for your car’s appearance helps you protect your investment. Appearance problems left unattended, like breaks in glass or body damage, can lead to larger problems and repairs. Frequent washing and periodic vehicle polishing go a long way toward protecting your investment. Keeping your vehicle consistently clean prevents the buildup of damaging chemicals and dirt that may damage your car’s finish. In areas of the country that use road salt in winter months, frequent washing can reduce the corrosive effects of salt that cause body rust through. Always use a different mitt for the tires and wheels than is used for the body and paint. To prevent stripping the vehicle’s finish, only soap specified for automotive cleaning should be used.